Earlier this week, Democratic presidential candidate Elizabeth Warren unveiled a series of policy proposals intended to curb the significant power of Silicon Valley’s biggest firms. (Facebook, Google, and Amazon got name-checked in the announcement, and Warren has since confirmed that her policies could also apply to companies like Apple.) She decided to let people know about the looming power of Big Tech by doing what most organizations do when they really want attention: she bought a Facebook ad. “Facebook and Google account for 70 percent of all internet traffic — if we didn’t run ads on Facebook, like this one, we wouldn’t be able to get our message out around the country,” one of her ads reads. “But that’s not how the internet should work. We need to break up the three big tech companies that dominate the internet, stifle competition, and influence how our democracy works.” She also published a similar ad in video form, laying out the abbreviated case against Big Tech. Yesterday, Politico reported, Facebook temporarily removed her anti-Big Tech ads. “We removed the ads because they violated our policies against use of our corporate logo,” a spokesperson said. They have since been reinstated “[i]n the interest of allowing robust debate.” Cool. “Curious why I think FB has too much power? Let’s start with their ability to shut down a debate over whether FB has too much power,” Warren shot back last night (on Twitter). The most nefarious interpretation of this sequence of events is that Facebook saw a powerful politician criticizing them and targeted her in order to silence her. This is rarely how this stuff works. The most likely version of this story is the one Facebook stated: they don’t allow others to use its logo. There are plenty of use cases that justify such a rule. Go to any large online platform and you’ll find dozens of scam accounts pretending to be the official platform holder. Twitter, to avoid impersonation, doesn’t allow handles to use the word “Twitter” in them. 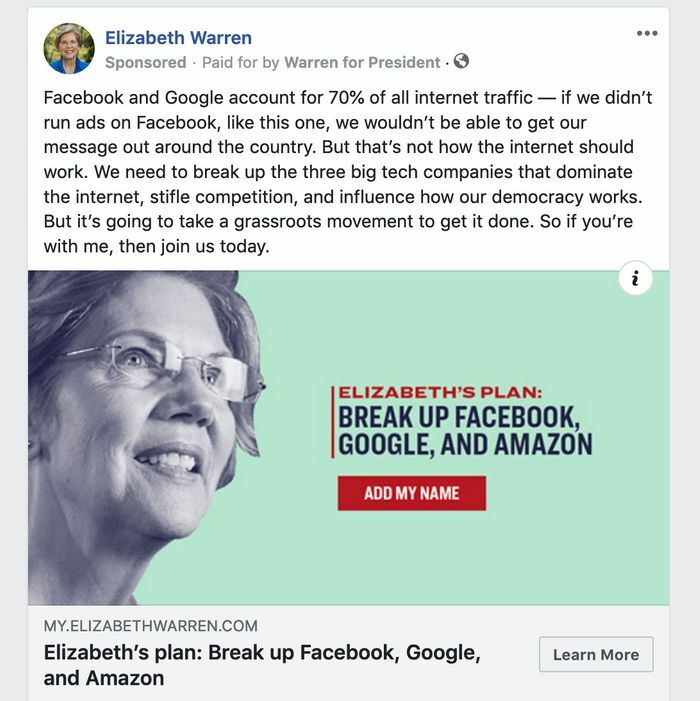 Obviously, Elizabeth Warren is not using Facebook’s logo to impersonate Facebook or for deceitful purposes, but Facebook does not care. By which I mean, Facebook is very committed to enforcing its rules equally across the spectrum of users (even though it often fails to do so). The company’s current moderation system is designed to operate in an environment where context, often implied or not easily discernible to an outsider, does not matter. And so down Warren’s ads went. Understanding this is the key to understanding why Big Tech is something to be concerned about. Even when it’s assumed to be operating in good faith and attempting to be fair, Facebook still makes the wrong call. It does this many times every day. The threat of Big Tech is not some nefarious Big Brother scenario in which the Thought Police eradicate any dissent; it’s that even when companies like Facebook are earnestly trying to do their jobs well, the scale at which they operate make its screw-ups and mistakes substantial.